Israeli forces have continued with systematic attacks against Palestinian civilians and their property in the occupied Palestinian territories (oPt) for the reporting period of 11- 17 December 2014. During the reporting period, Israeli forces killed a Palestinian civilian in excessive use of force in Qalandya refugee camp, north of occupied Jerusalem. They also wounded 9 Palestinian civilians in the West Bank and Gaza Strip, including 2 children; 5 of whom were wounded in the West Bank and 5 others were wounded in the Gaza Strip. Moreover, 6 Palestinian civilians, including 3 children and 2 women, were wounded due to the explosion of a suspicious object, north of the Gaza Strip. In the West Bank, in excessive use of force, on 16 December 2014, a Palestinian civilian was killed in Qalandya refugee camp, north of occupied Jerusalem, when Israeli forces moved into the camp to arrest Palestinians. Israeli forces used excessive force against peaceful protests organised by Palestinian civilians, international and Israeli human rights defenders in protest at the construction of the annexation wall and settlement activities in the West Bank. As a result, a 14-year-old child sustained a bullet wound to the chest and a 16-year-old one sustained a bullet wound to the leg. In the Gaza Strip, on 12 December 2014, 4 Palestinian civilians were wounded when Israeli forces stationed along the border fence, east of Jabalia in the north of the Gaza Strip, opened fire at a group of civilians, who were present around. In the context of explosions of suspicious objects of the Israeli military remnants in the Gaza Strip, 6 Palestinian civilians, including 3 children and 2 women, sustained moderate wounds, due to the explosion of a suspicious object in the north of the Gaza Strip. During the reporting period, Israeli forces conducted at least 29 military incursions into Palestinian communities in the West Bank. During these incursions, Israeli forces arrested at least 54 Palestinians, including 8 children and 2 women. Thirty-one of these Palestinians, including 6 children and a woman, were arrested in Jerusalem. In the Gaza Strip, on 16 December 2014, Israeli forces moved about 150 meters into the east of al-Fokhari village, southeast of Khan Yunis in the southern Gaza Strip. They levelled lands along the border fence for few hours and withdrew later. Furthermore, Israeli forces station along the border fence, east of al-Bureij refugee camp in the central Gaza Strip, arrested 2 Palestinian children who attempted to sneak into Israel through the border fence. The illegal closure of the Gaza Strip, which has been steadily tightened since June 2007 has had a disastrous impact on the humanitarian and economic situation in the Gaza Strip. The Israeli authorities impose measures to undermine the freedom of trade, including the basic needs for the Gaza Strip population and the agricultural and industrial products to be exported. For 8 consecutive years, Israel has tightened the land and naval closure to isolate the Gaza Strip from the West Bank, including occupied Jerusalem, and other countries around the world. This resulted in grave violations of the economic, social and cultural rights and a deterioration of living conditions for 1.8 million people. The Israeli authorities have established Karm Abu Salem (Kerem Shaloum) as the sole crossing for imports and exports in order to exercise its control over the Gaza Strip’s economy. They also aim at imposing a complete ban on the Gaza Strip’s exports. 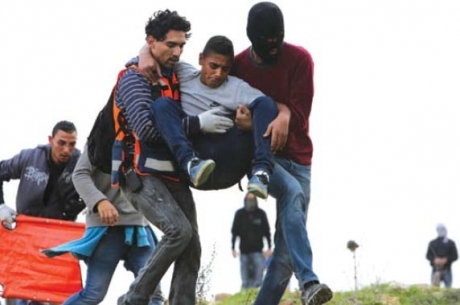 During the reporting period, Israeli forces arrested a Palestinian patient who obtained a permit to travel to the West Bank for medical treatment, while another civilian accompanying his father was arrested while the father was denied travel for medical treatment. Efforts to create a Jewish demographic majority in occupied East Jerusalem: Israeli municipality issued more house demolition notices. On 14 December 2014, they handed notices to demolish a number of houses in Silwan village under the pretext of lacking construction permits. Most of the houses were established 15 years ago. They also handed notices to destroy numerous houses in ‘Ain al-Foqa neighborhood. On 14 December 2014, Israeli forces moved into al-Koum village, south west of Hebron and handed 6 residents notices to demolish their houses under the pretext of illegal construction in Area “C”. On 15 December 2014, Israeli forces moved into Beit Ummar village, north of Hebron, and handed two residents notices to demolish their houses under the pretext of illegal construction in Area “C”. On the aforementioned day, Israeli forces moved into Tqou’ village, southeast of Bethlehem, and handed 4 residents notices to demolish their houses under the pretext of illegal construction in Area “C”. During the reporting period, Israeli soldiers used excessive force against peaceful demonstrations organized by Palestinian civilians, international and Israeli human rights defenders in protest at the construction of the annexation wall and settlement activities in the West Bank. As a result, 3 demonstrators were wounded. In the same context, 2 Palestinian children were wounded during 2 other protests organized against the Israeli forces' and settlers' attacks in al-Aqsa mosque in Jerusalem. · Following the Friday prayer, on 12 December 2014, dozens of Palestinian civilians and international and Israeli human rights defenders organized a peaceful demonstration in Bil’in, west of Ramallah, in protest at the killing of Minister Ziad Abu 'Ain, Director of the Palestinian Authority Commission against the Annexation Wall and Settlement Activity. The demonstrators took the streets raising the Palestinian flags and headed to the liberated territories near the annexation wall. Early in the morning, Israeli forces closed all entrances to the city to prevent Palestinian civilians and international and Israeli human rights defenders from participating in the protests. Protestors marched by the annexation wall and tried to cross the fence. Israeli soldiers stationed behind the wall, in the western area, and a large number of soldiers deployed along it, fired live bullets, tear gas canisters, rubber-coated steel bullets, sound bombs and wastewater at them and chased them into the olive fields. As a result, a protestor was hit by a gas canister to the head and another was hit by a gas canister to the leg. Moreover, a number of demonstrators suffered tear gas inhalation and others sustained bruises as Israeli soldiers beat them up. · On the same day, dozens of Palestinian civilians organised a peaceful demonstration in the centre of Ni’lin village, west of Ramallah, in protest at the killing of Minister Ziad Abu 'Ain, Director of the Palestinian Authority Commission against the Annexation Wall and Settlement Activity. The demonstrators took the streets and headed to the annexation wall. Israeli forces closed the gates of the wall with barbwires and prevented the demonstrators from crossing to the land behind it before they responded by throwing stones. Israeli soldiers fired live ammunition, rubber-coated metal bullets, sound bombs and tear gas canisters at the civilians, and chased them into the village. As a result, a protestor sustained a bullet wound to the thigh. Moreover, many civilians suffered tear gas inhalation and others sustained bruises as Israeli soldiers beat them up. · Around the same time, dozens of Palestinian civilians and Israeli and international human rights defenders organised a peaceful demonstration in al-Nabi Saleh village, southwest of Ramallah, in protest at the killing of Minister Ziad Abu 'Ain, Director of the Palestinian Authority Commission against the Annexation Wall and Settlement Activity. The demonstrators made their way in the streets raising the Palestinian flags and chanting slogans against the occupation and in support of the Palestinian unity resistance, and then they headed to the lands that the settlers are trying to rob by force near “Halmish” settlement. Israeli forces had closed all the entrances of the village since the morning to prevent Palestinian and international activists and journalists from participating in the demonstration. When they arrived at the aforementioned land, demonstrators were met by live bullets, tear gas canisters, rubber-coated steel bullets, sound bombs and skunk water and were chased into the village. As a result, many demonstrators suffered tear gas inhalation and other sustained bruises as Israeli soldiers beat them up. · Also at approximately 13:20, Palestinian civilians and international solidarity activists organized a protest in the center of Kufor Qaddoum village, northeast of Qalqilya, heading to the eastern entrance of the village in protest against closing that entrance since the beginning of al-Aqsa Intifada with an iron gate. The demonstrators threw stones at Israeli soldiers, who fired sound bombs and tear gas canisters in response. As a result, many demonstrators suffered tear gas inhalation and other sustained bruises as Israeli soldiers beat them up. · On Thursday afternoon, 12 December 2014, dozens of Palestinian young men gathered in the center of Beit Ommar village, north of Hebron, in protest at Israeli policies and the killing of Minister Ziad Abu 'Ain, Director of the Palestinian Authority Commission against the Annexation Wall and Settlement Activity. They headed to al-Daher and Safa areas near "Karmi Tsour" settlement, west of the village. Once they approached there, Israeli soldiers fired sound bombs, tear gas canisters and rubber-coated metal bullets in response. As a result, a 14-year-old child sustained 2 bullet wounds to the chest and leg. He was then taken to the village's medical compound for medical treatment. · Also on Friday afternoon, dozens of Palestinian youngsters gathered in the southern neighbourhoods of Hebron to protest at Israeli policies and the killing of Minister Ziad Abu 'Ain, Director of the Palestinian Authority Commission against the Annexation Wall and Settlement Activity. Israeli forces fired sound bombs, tear gas canisters and rubber-coated metal bullets at the demonstrators. As a result, 35-year-old Abdul Razaq Abdul Hay Abu Turky and 15-year-old Taleb Ghaleb Taha were wounded. · On the same day, dozens of Palestinian civilians gathered at the western entrance of Selwad village, northeast of Ramallah, on Selwad-Yabroud road near street (60) to organize a protest against Israeli policies. The protestors set fire to tires and threw stones and empty bottles at Israeli soldiers, who fired live ammunition, rubber-coated metal bullets, sound bombs and tear gas canisters in response. As a result, a number of protestors suffered tear gas inhalation, and others sustained bruises as Israeli soldiers beat them up. The cooking gas crisis has fluctuated due to the closure of Karm Abu Salem for security claims. According to PCHR’s follow-up, Israeli authorities only allow an average of 98 tons of cooking gas into Gaza per day. This limited quantity is less than half of the daily needs, which is 200 tons per day of the civilian population in the Gaza Strip during winter. The crisis has unprecedentedly aggravated for around six weeks due to cold weather and overconsumption in addition to the power outage and using gas as an alternative in many instances of electricity. The lack of diesel and benzene led to the aggravation of the crisis as a result of using the gas cylinder for cars or as an alternative for benzene to run generators. As a result, the demand for gas further increased. For almost 7 consecutive years, Israeli forces have continued to prevent the delivery of construction materials to the Gaza Strip. Two years ago, Israeli forces approved the delivery of limited quantities of construction materials for a number of international organizations in the Gaza Strip. On 17 September 2013, they allowed the entry of limited quantities of construction materials for the private sector. However, on 13 October 2013, they re-banned it claiming that these materials are used for constructing tunnels. Last week, Israeli forces allowed the entry of construction materials only for UNRWA and UNDP projects. As a result, construction works have completely stopped impacting all sectors related to construction and an increase in unemployment levels. During the 51-day Israeli offensive on the Gaza Strip in July and August 2014, Israeli authorities did not allow the entry of any construction materials. As a result, vital and infrastructure projects have been obstructed so far. · Hebron: Israeli forces have continued to impose severe restrictions on the movement of Palestinian civilians. At approximately 07:00 on Saturday, 13 December 2014, Israeli forces established two checkpoints: one at the entrance of Halhoul and the other at the entrance of Sa’ir village. The checkpoints were removed and no arrests were reported. At approximately 07:00 on Monday, 15 December 2014, Israeli forces established two checkpoints: one at the entrance of Halhoul and the other at the entrance of Sa’ir village, northeast of Hebron. The checkpoints were removed and no arrests were reported. At approximately 08:00, another checkpoint was established at the northern entrance of the city. All checkpoints were removed and no arrests were reported. In the morning hours of Tuesday, 16 December 2014, Israeli forces established a number of checkpoints in different areas: the entrance of Sair, northeast of the city; the northern entrance of Halhoul, north of the city; the northern entrance of the city; and the entrance of al-Fawwar, west of the city. All checkpoints were removed and no arrests were reported. · Qalqilya: Israeli forces have continued to impose severe restrictions on the movement of Palestinian civilians. At approximately 15:00 on Sunday, 07 December 2014, Israeli forces established a checkpoint at the entrance of Izbat al-Tabib village.at approximately 15:45, another checkpoint was established at the eastern entrance of the city. All checkpoints were removed and no arrests were reported. · Tulkarm: Israeli forces have continued to impose severe restrictions on the movement of Palestinian civilians. At approximately 17:30 on Friday, 12 December 2014, Israeli forces stationed ‘Annab military checkpoint which is established on the road between Tulkarm and Nablus, east of the city, tightened their restriction against civilians and obstructed their movement. Later that day, he tightening ended and no arrests were reported. · Jenin: Israeli forces have continued to impose severe restrictions on the movement of Palestinian civilians. At approximately 14:00 on Tuesday, 12 December 2014, Israeli forces established a checkpoint on the road between Kufur Dan and al-Yamoun villages, north of the city. Later, the checkpoint was removed and no arrests were reported. · Salfit: Israeli forces have continued to impose severe restrictions on the movement of Palestinian civilians. At approximately 17:25 on Thursday, 11 December 2014, Israeli forces established a checkpoint under Kasaka Bridge, east of the city. Later, the checkpoint was removed and no arrests were reported. At approximately 17:30 on Friday, 12 December 2014, Israeli forces established a checkpoint in the northern entrance of the city. Later, the checkpoint was removed and no arrests were reported. At approximately 21:35 on Saturday, 13 December 2014, Israeli forces established a checkpoint at the entrance of Deir Ballout village, west of the city. Later, the checkpoint was removed and no arrests were reported. At approximately 23:00 on Sunday, 14 December 2014, Israeli forces established a checkpoint under Kasaka Bridge, east of the city. At approximately 23:40, they established a checkpoint at the northern entrance of the city. · On Thursday morning, 11 December 2014, Israeli forces stationed at the Container checkpoint arrested Qutaiba Salah Qassem (28) from Hindaza mountain area in Bethlehem, and Mahmoud Karim Ayyad (30) from al-Dheisha refugee camp, south of the city, and took them to an unknown destination. · On the aforementioned day, Israeli forces stationed at the Container checkpoint arrested Osama Shahin(26) from Doura, southwest of Hebron, and took him to an unknown destination. · On aforementioned day, Israeli forces stationed at the entrance of Beit Ummar village, north of Hebron, arrested Jihad Khalil Hamad al-‘Allami (19) and Bilal Habes Hamdan al-Allami (19) and took them to an unknown destination. · On Sunday morning, 14 December 2014, Israeli forces arrested Asmaa Jawdat Jamil Balhawi (38) when she was entering “Kisaout” prison in Negev Desert in a visit to her husband Salah Balhawi, who is sentenced to 4 years in Israeli prisons, and took them to an unknown destination. · On the aforementioned day, Israeli forces stationed at the entrance of Beit Ummar village, north of Hebron, arrested Rami Fahmi Abdul Latif Bahar (34) and took him to an unknown destination. · At approximately 23:00, Israeli forces arrested Musab Hasan Balasma (22), from Salfit, when he was crossing Howara checkpoint, south of Nablus and took them to an unknown destination. · At approximately 10:00 on Sunday, 14 December 2014, Israeli municipality staffs, guarded by Israeli special forces, handed notices to demolish residential buildings in Silwan village under the pretext of not having construction permits. According to Hani Gaith, Israeli special forces moved into is older brother’s house, ex-prisoner Adnan Ghaith, the secretary of Fatah movement in Jerusalem, in the central neighborhood in Silwan. They handed the family an administrative order prescribing that their house, which was established 25 years ago, would be destroyed. He added that the Israeli soldiers verbally abused the family, particularly his 65-year-old father. The verbal clash finally led to the arrest of his brother Bilal (37). Furthermore, Israeli municipality staffs handed Muhammad Tawfiq Ghaith notices to destroy his house in Silwan, where he and his wife reside. They also handed administrative orders to 3 houses belonging to Ahmed al-‘Abbasi and his sons in Ain al-Louza neighborhood. The houses were established on an area of 300 square meters, 20 years ago. The municipality staff also handed notices to destroy houses in Ain al-Foqa neighborhood. · At approximately 14:00 on Monday, 15 December 2014, Israeli municipality staffs and Israeli special forces moved into a house belonging to Mu’taz Hijazi in al-Thaouri neighborhood in Silwan. They handed the family a notice to destroy their house. It should be noted that Mu’taz Hijazi was killed on 30 October 2014 by Israeli special forces under the pretext of shooting at Rabbi Yehuda Glick. · At approximately 16:00 on the aforementioned day, Israeli municipality handed Jamal ‘Amro a notice to destroy his house in al-Souana neighborhood in the Old City in Jerusalem under the pretext of not having a construction permit. The aforementioned civilian told PCHR that the house was established in 1945 and it consists of two floors and resided by 19 persons. He added that the decision to destroy the house is purely political aiming to punish the family. The aforementioned person’s wife was arrested more than once, and his eldest son who works in the Islamic Waqf was also arrested. · At approximately 04:00 on Thursday, 11 December 2014, Israeli forces moved into al-Thouri neighborhood, east of the Old City in Jerusalem. They raided and searched a number of houses and arrested 4 residents: Muhammad Nour al-din al-Tawil (26); Ahmed Amin al-Juba (23); Muhammad Naser ‘Alawat (19); and Ahmed Faraj Taha (19). · At approximately 09:00 on the aforementioned day, Israeli forces raided a house belonging to al-Shaloudi family the family intends to reconstruct after Israeli forces destroyed it on 19 November 2014 in al-Bustan neighborhood, south of the Old City in Jerusalem. It should be noted that Abdel Rahman al-Shaloudi was killed on 22 October 2014 by the light train guards in al-Sheikh Jarrah neighborhood claiming that he ran down a group of settlers. · At approximately 04:30, on Friday, 12 December 2014, Israeli forces moved into Jabal al –Mukabber neighborhood, southeast of Jerusalem. They raided and searched a number of houses and arrested: Ali Ahmed Oweisat (18); Said Ibrahim Abu Jamal (37); Rifat Muhammad Khaiyat (34); and Younis Samih Eliyan (27). · At approximately 04:40, on the aforementioned day, Israeli forces moved into a house belonging to Sharif Abdu in Wadi al-Jouz neighborhood. They arrested his son Abdullah (17) and took him to an unknown destination. · At approximately 05:00, Israeli forces moved into a house belonging to Muhammad Dandis in Ras al-Amoud neighborhood, east of the Old City in Jerusalem. They arrested his son Abdul Rahman (23). · At approximately 06:00, on the aforementioned day, Israeli forces moved into al-Isawiah. They raided and searched a number of houses and arrested 3 residents: Ahmed Haid Mahmoud (28); Tareq Ziad Darwich (24); and Ali Muhammad Darwich (22). · At approximately 13:00, on Saturday, 13 December 2014, Israeli forces moved into al-Tour neighborhood, east of the Old City in Jerusalem after dozens of Palestinians threw stones at an Israeli settler’s vehicle. They fired rubber-coated metal bullets and tear gas canisters. They arrested Imran Rabaia (18) and Fadi Talal al-Sayyad (21). · At approximately 14:00 on Sunday, 14 Decmber 2014, Israeli forces moved into Bab Hatta neighborhood. They raided and searched number of houses and arrested 3 children: Tawfiq Najeeb (16); Zakarya Izz al-Din al-Bakri (16); and Mustafa Isamil Abu Sneina (15). · At approximately 02:00 on Monday, 15 December 2014, Israeli forces raided a house belonging to Omar Shalabi (30) former secretary of Fatah movement in Jerusalem. They confiscated a number of computers and attacked the family members. They arrested the aforementioned and took him to an unknown destination. · At approximately 02:30, Israeli forces raided a house belonging to ex-prisoner Fawzi Omar Mheisin (30) in Shufat refugee camp. They arrested him and confiscated his computer and mobile phone. · At approximately 14:00, Israeli forces arrested Diala Ali (25) when she was leaving through al-Silsila gate in Jerusalem. · At approximately 21:00, Israeli forces arrested the head of Fatah Youth Movement Ibrahim Abu Ghariba (39) when he was in Beit Hanin village, north of the city. According to Muhammad al-Sharbati, Israeli forces arrested Abu Ghariba after he was stopped at a checkpoint then he was taken Nabi Yaqoub police station. · At approximately 14:00 on Tuesday, 16 December 2014, Israeli forces arrested Yazan Imad al-‘Abbasi (11) and Ahmed Abdul Hadi al-‘Abbasi (11) in Ain al-Louza neighborhood. According to eyewitness testimonies, the children were arrested when they were heading home from school. - Ramadan Hasan Mustafa al-Rujoub, two houses under construction; each of them has an area of 150 square meters. - Khaled Yousif Abdul Majeed Brighith, a house used for agricultural purposes, which was established on an area of 60 square meters 4 years ago. · In the evening of the aforementioned day, Israeli forces accompanied by a vehicle belonging to the Construction and Organization Department in the Israeli Civil Administration Department moved into Tqou’ village, southeast of Bethlehem. They stationed at Kherbat al-Deir arre, near the municipality intersection and handed 4 notices to stop construction in houses belongin to: Musa Salem Musa; Ahmed Muhammed Suleiman; Saher Ali Hajahija; and Mahmoud ‘Aish Hajahija. The Israeli Prison Service (IPS) denied Palestinian prisoners the right to enter blankets and warm winter garments into their cells with the advent of a cold winter in Palestine, a report issued by the prisoners and ex-prisoners committee on Monday read. The committee said things have gone much worse particularly, but not exclusively, in the Israeli occupation jails located in the desert, namely the Negev, Nafha, Beer Sheba and Eshel lock-ups. The fact that such prisons are crammed with the largest number of Palestinian detainees adds fuel to fire, the report added. The IPS has been seizing most of the mattresses and clothes brought by the prisoners’ families as a means to force the detainees to purchase poor-quality coverlets and warn-out kit at very high prices. Along the same line, ex-prisoner Mohamed Amir Abu Rayan sounded alarm bells over the critical health status endured by the Palestinian prisoner patients held at the Ramla prison clinic. Abu Rayen, arrested on November 7, was diagnosed with putrefactions in his bones and arteries along with a monoplegia after the Israeli occupation soldiers shot him in his left foot. Ex-prisoner Abu Rayan said life has become quite unbearable for the Palestinian detainees at the Ramla jail. He pushed for their urgent transfer to a civil hospital so as to enable them to carry out the needed emergency check-ups and medical diagnoses. Head of the Prisoner’s Society in al-Khalil, Amjad al-Najar, said Abu Rayan’s statements are the best “sworn affidavits” and testimonies bearing out the crimes perpetrated by the Israeli wardens against the Palestinian captives amid an appalling international apathy.